The autumn sun is sinking behind a jagged Manhattan skyline like a huge Halloween pumpkin bleeding into a plum-pink twilight. Standing with a cup of honeyed jasmine tea behind my window on the top floor of a ten-story redbrick building, browned with time, I’m listening to the seamless procession of Chopin’s Preludes streaming from my old CD player. The music, so elegant, languorous, and suffused with the colors of French impressionist paintings, I feel I’m in heaven in my cluttered studio apartment. Just when I drank up the bottom nectar of the sweet tea remaining in the cup, and the music changing to a waltz, I notice a man moving behind a window of the high-rise twice taller than my building—taller, but it looks one dimensional and artless in its steel and concrete facade. There is another building separating us, which is a story lower than mine with a quaint-looking water tank that looks like a plank turret standing in the corner of the roof. Diagonally behind that plank tank I can only see him in a fuzzy profile from a distance, but clearly enough to recognize the man’s physique. His large picture window standing somewhat parallel to my smaller one, I remember seeing him a few times behind that window in full view. Built stocky, he has closely-knit thick eyebrows under a crown of dark bushy hair over massive shoulders?massive, but not in an athletic way. Somehow he makes me believe he must have mossy patches of chest hair that extend to the back of his shoulders and upper arms. I now see him slowly pacing around the room, his frame a bit hunched forward like a bear looking for a prey, clasping and unclasping his hands as if consumed in some sort of dark scheme. As I feel his intensity spilling on me through that distance, I narrow my glare over him like a sly fox. Dressed in a pair of dark baggy slacks and a loose shirt without a tie, I presume he could be a personal injury lawyer, an accountant, or a theatrical director. Before I know, he stops pacing and bends over a large briefcase on the floor, and pulls out what looks like a brown folder. As if he were aware of being watched by someone over his shoulder, but not once looking out the window, he moves ever cautiously. Even if he looked in my direction, I don’t think he could detect my small frame standing behind my half drawn flimsy curtain. After a bit of hesitation, he sticks the folder under his armpit and walks to an adjoining room, which appears to be a bedroom with its own window. In that room, I notice a small figure seated in an armchair. By the brownish long wavy hair flowing over the side of the chair, it is a young woman. He now walks to her, bends over, and says something. The woman nods, gets up from her chair, and walks to the window. She rolls down a blind, walks to the living room, and rolls down that window’s blind as well. Although I no longer see them behind those closed blinds, I know that she is not the tall lithesome blonde I used to see in that apartment over the past six months or so. Every once in a while I’d notice the lovely blonde when she was there. She used to move around the dinner table behind the window, entertaining guests, gently waving her bare arms while she talked to someone, just like in a silent movie. Whatever the occasion, the couple usually had about six people around the table under a large chandelier that glowed in multiple hues, reminding me of a small cruise boat on the Hudson River on summer nights. 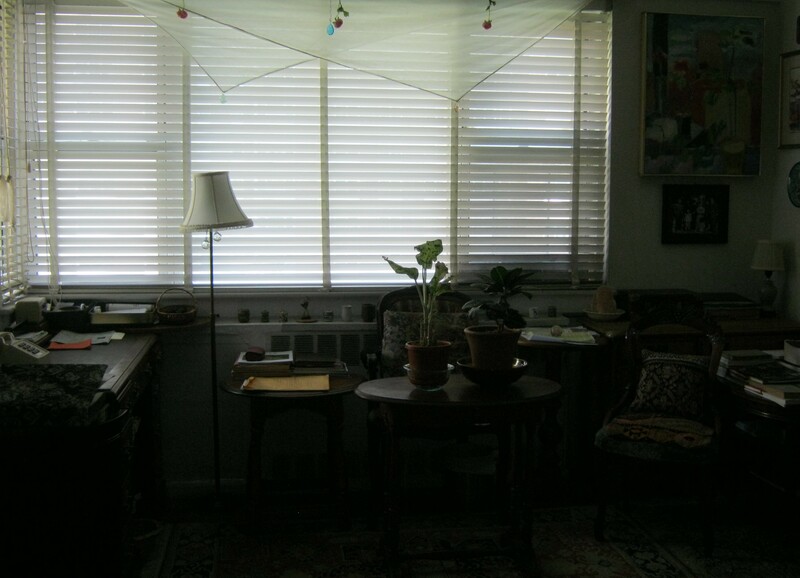 And I wasn’t even aware he had blinds then, since no one ever rolled them down. But tonight, there is a new lady in that apartment?a short brunette with her fuller figure? and the blinds are drawn as if all that had been going on with his blonde was to be obliterated by his new brunette who hurled down the blinds, like the curtain falling at the end of a play. All I see now is the pale metallic sheen from the closed blinds?blinds that reflect the frailty of the night, of the human psyche, mocking me and my Chopin’s Fantaisie-Impromptu. It is noontime on a hot July weekday in midtown Manhattan. Cafés and delis bustle with lunchtime customers from nearby office buildings and from a construction site two blocks down. Car fumes and traffic noises mingle with warm summer haze hovering around a jagged skyline. About a dozen construction workers who spilled out onto the sidewalk with bags of sandwiches and cans of soda are sitting on the sidewalk against a building wall, legs outstretched, eating the lunch. In their dusty boots and soiled blue jeans and tee shirts, they’re in heaven, taking breaks in the secure ground level, away from the high scaffolding or the raised floors. Just when I am about to turn the corner near Fleet Bank across the street, I hear someone yelling “Stop! Stop!” Quickly I turn and see a station wagon come to a sudden stop in the midst of backing from the curb. A little black boy in white shorts emerges from behind the rear tire of the station wagon and slumps onto the pavement. Immediately, one of the construction workers runs toward him. The boy looks no more than six years old. “Are you hurt?” shouts the construction worker, and gently pulls the boy up by his arm from the pavement. The driver of the station wagon jumps out of his car, looking apprehensive. “Are you okay?” the driver asks nervously as he approaches the boy. The boy, looking surprised by the question, looks down his feet and shakes his spindly legs, one at a time, and gives an okay sign with two thumbs up, effortlessly, as if he had used that gesture many a time before. But then, his round brown eyes turn rounder realizing the attention showered by the two young white men who tower over him. Mystified by the child’s composure and calm, the driver keeps staring at him. “Are you sure you’re okay?” he asks one more time, and, together with the construction worker, they turn the boy this way and that to check his legs. The boy winces with embarrassment and breaks into a peevish smile, revealing a couple of missing front teeth. “I think he simply tripped over his sneakers,” says the construction worker. Relieved, the driver calls the boy a lucky boy, gets into to his car and drives off. The construction worker remains and asks the boy where he was going. He points to the Fleet Bank across the street. The construction worker walks the boy across the street, into the bank, and speaks to a security guard. The guard leads the boy to a seating area, and the construction worker walks out of the bank and crosses back across the street. His fellow workers give him their thumbs-up, munching on their sandwich. In the bank, an elderly black woman in gray cotton dress and a wide-brimmed straw hat walks from a teller’s window in a slow stride. She emanates an impression that she is not a stranger there. She used to come to the bank to cash her paychecks during the years she was working as an office cleaner in the area. Although retired for some time now, she still keeps her monthly routine visiting the bank to cash her modest pension and social security checks. She feels safer there rather than the uptown where she lives, especially with her grandson under her care while her daughter works during the day. Checks cashed, she carefully stuffs the bank envelope into her brown handbag, slings it over her sloped shoulder, and clutches it to her chest. Satisfied with what she’s done, she narrows her eyes toward the seating area. The boy springs from the chair and runs toward her. “Grandma! Grandma! Macdonal!” he calls out joyfully and points at the MacDonald across the street. Beaming with a smile, he stretches out his little arms and gives the woman a big hug, causing her pleasantly alarmed by this outburst of affection from the usually quiet boy. Unaware what had happened to her grandson while she was at the bank window, she slowly bends over and plants a kiss on his forehead. She gently takes hold of the boy’s hand and slowly heads to the door, her head getting heavy with an urgent disbursement to make for a new pair of sneakers for her grandson. It’s been a while since she had noticed the soles of his sneakers were eroding fast, causing him to trip on the pavement. The boy, comforted by the assuring words of his grandmother, doesn’t say anything. Their hands locked together, the two walk quietly out of the bank, into the street and toward the yellow sign at McDonald’s with its smiling M.
Born and educated in Seoul, Korea, Therese Young Kim studied literature at Kyung-Hee University before coming to America decades ago. 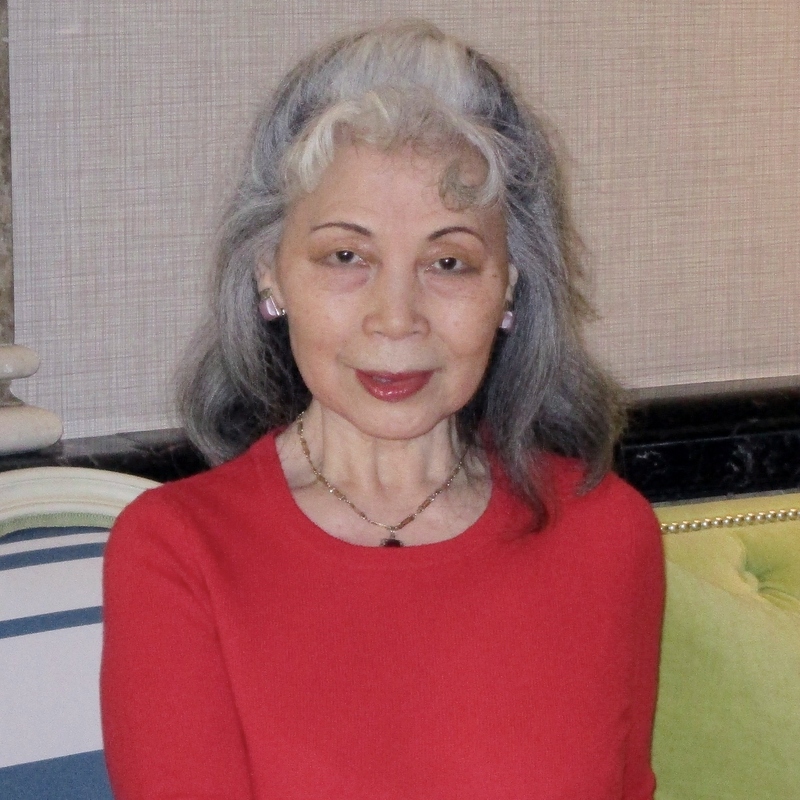 She worked as a professional interpreter for over 25 years in New York, while working on poetry and stories in the years following, culminating in the novel, Nayoung’s Journey. Her works appeared in South Korean literary journals and in the U.S. literary magazines, such as Infinity and Rosebud. On January 26, 2017 her two poems were published in Tuck Magazine. A few more poems are forthcoming in Poetry Pacific in May, 2017.